The age group most at risk from abusive relationships is 16-24. Only 33% of teenagers in an abusive relationship talk to someone about it. We need to increase this percentage. By increasing young people’s knowledge of what a healthy relationship is and how to spot early warning signs of abuse, they are much more likely to seek support and develop safe and healthy relationships. Tender has worked in over 700 London schools and youth provision centres over the past 11 years. We have developed an effective and sensitive approach which puts the wellbeing of students first. 90% of participants report they have more understanding of what a healthy and unhealthy relationships is and 82% have more knowledge about where to seek support or advice. We are looking for schools and youth provision centres to support us and choose us as their Charity of the Year! Fundraising could take place around Valentine’s Day, International Women’s Day, World Health Day, Anti Bullying Week, at the end of term, as part of enrichment days or holiday activities. 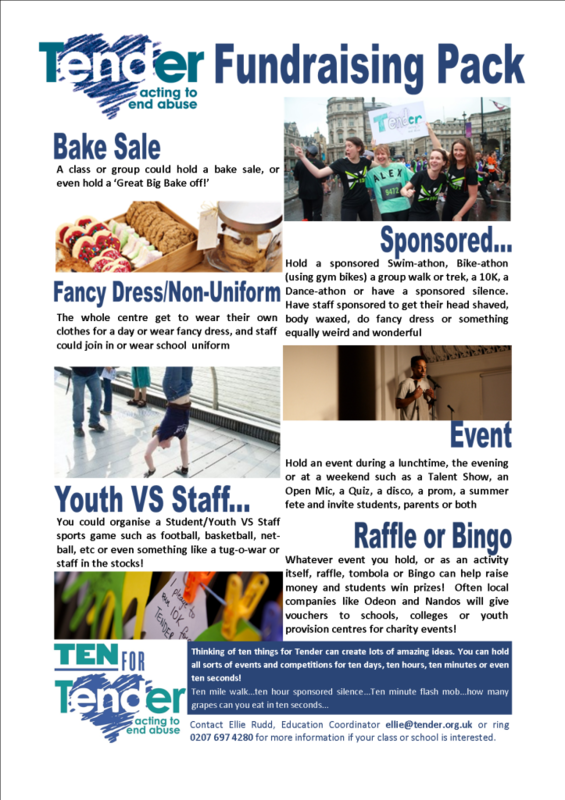 Below are some examples of ways to raise funds for Tender at your school or youth centre! Please do share this with any staff that may be interested! Contact Ellie (ellie@tender.org.uk) if you need more information or are interesting in choosing Tender as your Charity of the Year!